Like the sounds of loons and laughter, the aroma of food on the grill, the feel of warm sun and cool water, Skippy and Dave bring you comfortable moments from the season of summer. Whether at a county fair, a resort, or a weekend festival, this is Skippy and Dave’s favorite show to perform outdoors. 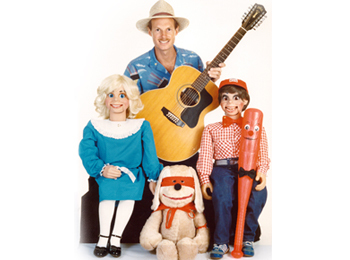 The songs they sing are cross-generational favorites like “I’m My Own Grandpa”, “Camp Granada”, and “The Boulder Junction Musky Jamboree”. Their ventriloquism routines range from York’s woeful vacations with various animals (the one with a cow was an udder disaster), to Skippy’s trip to the zoo with an elephant, to a baseball game fielded by Abbot and Costello in their classic, “Who’s on First”, done in duet by Dave and a talking baseball bat. It’s a great show to sip a cool drink and laugh-along with!